Earlier this month at the national art therapy conference in San Antonio, I was able to spend time dialoguing in a focus group I led about one of my favorite topics: the role of social media in creating connection, community, and sustaining creativity. This group time was a very nice opportunity to talk with art therapists and art therapy students about how they use social media, what interests & challenges them, as well as the different ways social media can be used within the art therapy community for networking, collaborating, art-making, and inspire one another. In comparison to a focus group I led on this same topic at the national conference 5 years ago (2009), the awareness and use of social media seemed to be a lot more integrated into our regular professional interactions and activity. This included, but was not limited to: connecting with other art therapists, inspiring & supporting our own creative process with art-making, taking to the social media air waves to promote what we are passionate about in art therapy (through blogging, creating Facebook pages, using hashtags, QR codes) and keeping updated on worldwide happenings and news in the art therapy community. The increasing use of smartphones, tablets, and apps (vs. 2009) to access social media in mobile form definitely has contributed to this day to day practice. Challenges voiced included understanding how to leverage the most out of different social media sites, having a mindful awareness of ones personal vs. professional life online, and keeping up with the constant changes, new developments, and activity in the world of social media. This was a great time to gather together about this topic off the grid! Thank you to everyone who attended! 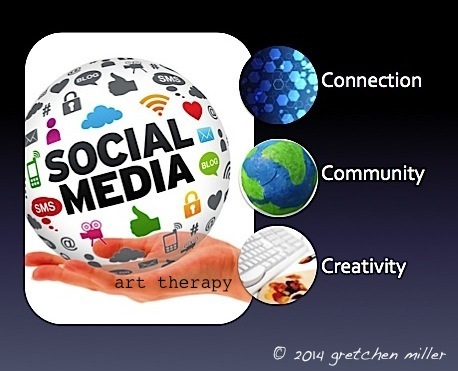 It is inspiring to learn more about how we as art therapists continue to use social media to strengthen our professional connections, enhance the relationship with our creativity, & create online opportunities for supporting our work, interests, & practice. When I received my beautiful copy of Drawn Together by Katarina Thorsen and her father Roar earlier this month, the mailing also included some of their original journal pages. What a wonderful addition! Much of Drawn Together’s content is told through the narrative of Kat and Roar’s journaling and art-making. In Chapter Three of their book, Kat describes that she and her father often worked in many, many journals back and forth with one another from 2002-2005. The intention of this shared experience was to help strengthen their connection, as well as manage and try to make sense of difficult events happening in their lives during that time. The journal pages sent to readers is an opportunity for these expressions to be shared and have others in the community also become part of their process through the invitation to add to them. To hold some of Kat and Roar’s pages in one hand and their touching story in the other, I felt such gratitude and privilege to be included in their art-making connection. Pages that have been added to and returned back to Kat for the Community Journal Project will then be exhibited at a Drawn Together event! What a great idea to celebrate the power of art, community, and connection! If you’re interested in also contributing you can learn more through this link. I’ve been sooo anticipating the arrival of Drawn Together: Maintaining Connections and Navigating Life’s Challenges with Art, a book co-written by Roar & Katarina (Kat) Thorsen…and my copy arrived yesterday! Drawn Together is Kat and Roar’s touching story about their relationship as daughter and father and how the power of art and the creative process can provide meaning, affirmation, and connection in the face of life changing illness and loss. I’ve followed Kat’s journey with her father’s stroke, cancer reoccurance, caregiving, and his art making moments through her blog, Instagram photos, and status updates on social media with much admiration. Before her father’s death, it was very moving to see Kat be so open and expressive about managing her father’s declining health and to embed the creative process throughout their journey to help Roar continue connection, create a legacy, and celebrate life & their relationship as father and daughter. Drawing, filmmaking, journaling, photo documentation, and the collaboration for creating their book were all creative ways memories, experiences, and emotions were embraced and continue to live on in the here and now. Yesterday as I opened the pages of Drawn Together and held their journal pages, I could feel Roar and Katarina’s love in my hands, as well as the essential role and life line art served in their relationship and journey. A very beautiful legacy…. on so many levels. As quoted by Kat, “Drawn Together is a call to action to collect stories and to create a legacy. Don’t wait for the ultimate moment, for that moment is here NOW and it is fleeting“. Agreed. Thanks to Roar & Kat for sharing their story with us. You can learn more about Drawn Together, here. This week-end I spent time putting together my presentation about Art Therapy Without Borders’ International Postcard Exchange for the Canadian Art Therapy Association and Ontario Art Therapy Association joint conference coming up during the first week of November. I am really looking forward to presenting this paper focusing on the project, its impact, and the role of art and social networking to connect the art therapy community worldwide. As I began to organize presentation content to highlight and include, I started to go through half of the postcards received over 6 months on behalf of ATWB from art therapists and art therapy students from all around the world. 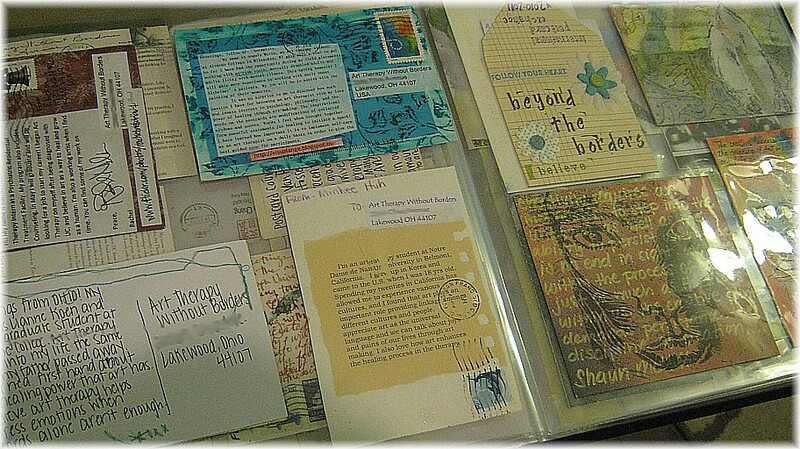 I re-visited each one in my careful piles: where the postcard arrived from, the art created, media used, as well as the experiences/stories shared on the back about the individual’s work, studies, or interests related to art therapy. I also remembered it was this time last year when the exchange started, mailing lists I organized from those who signed up were just sent out to over 300 participants, and the first postcards for the exchange were already starting to come in. Last October, I could have never imagined the overall impact, enthusiasm, and outreach that launching this exchange of mail art would have on facilitating connection, building community, and empowering the international art therapy community. Collectively re-visiting the postcards in one sitting and no longer in “organizing” mode gave me a new and simplified appreciation for the project and to reflect on what inspired me to organize the exchange in the first place. Introduce a fun, creative way for art therapists and art therapy students to learn more about each other and use the power of social media and art-making to network, connect, and create/receive art. 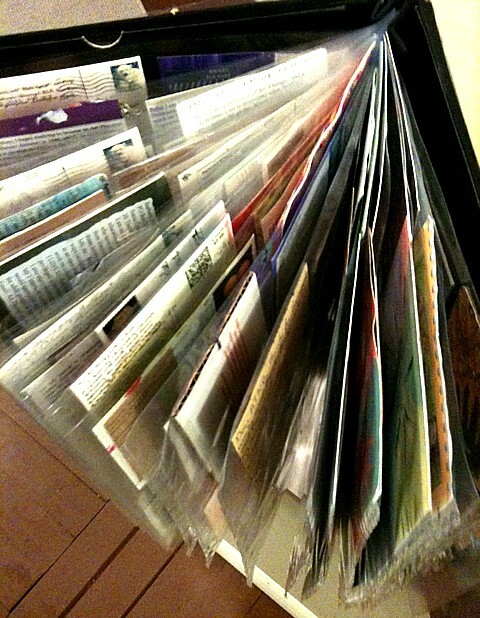 I was inspired to do a different kind of and much-needed type of “organizing” that included finally finding a good solution to display and store the postcards I’ve had since the exchange closed April. Many times, I have attempted different options, with no success and struggled with frustration on how to bring everything together in a way that made sense. Finally the idea to use 12×12 plastic sleeves (so both sides of the postcard could be viewed), some clear adhesive dots, and a scrapbooking album, came to mind as something that might actually work (duh). After a trip to the craft aisle and a few hours later, an entire album was filled edge to edge with 26 pages of beautiful postcard art. To view the postcards I received together in this way was amazing and creating this album helped me honor as well as process my own experience with the project as a participant, recipient, and organizer. Thank you again to everyone who participated and contributed to this exchange. To view all the postcard art from the exchange, you can check them all out here via Art Therapy Without Border’s Web Album on Google. And… don’t forget, 6 Degrees of Creativity also includes five other workshops– chock full of offerings that will inspire and empower your art making and creative practice with themes of positive psychology, gratitude, transformation, social contemplation, and more! Registration is open now until December 1. The 6 Degrees of Creativity fun starts October 10! 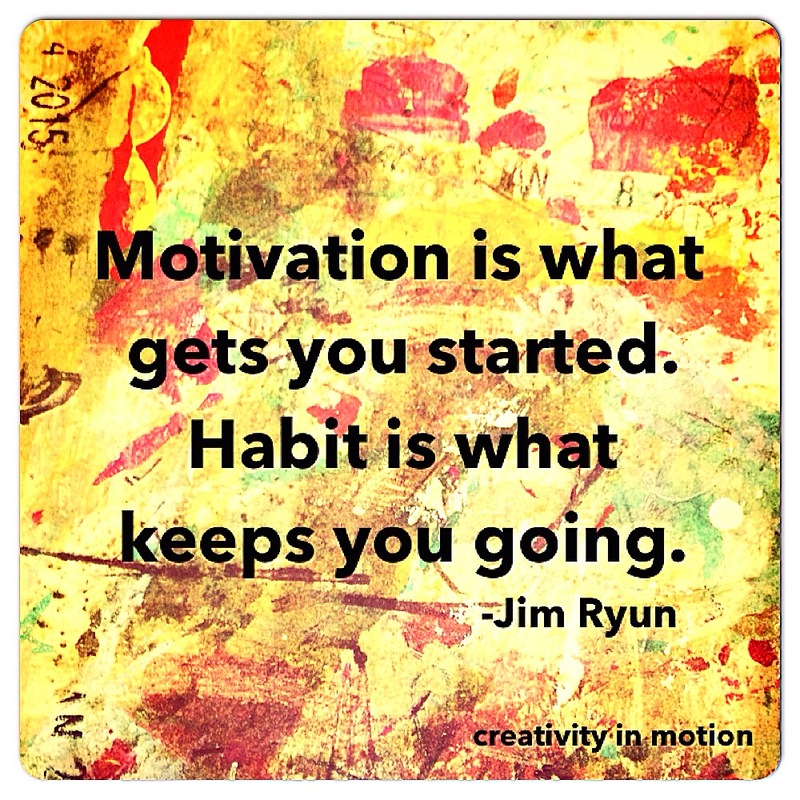 Welcome to Creativity in Motion: Reflections on Creativity, Connection, & Collaboration. What you will be able to discover here are my thoughts, writing, and art on how creativity, connection, and collaboration foster inspiration, energy, and empowerment in my relationships, life, work, and play. I find great value in these concepts and hope that through sharing my experiences, exchanging ideas and interests in this topic, that myself and visitors to this blog will continue to learn and grow as innovators, connectors, and collaborators. 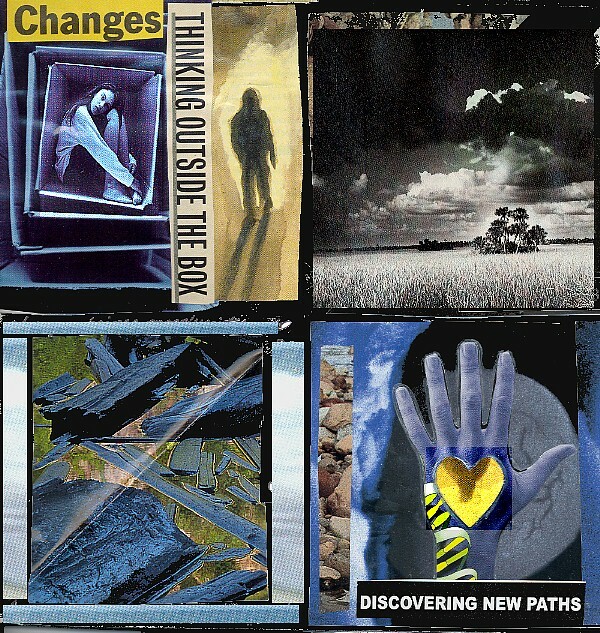 About the collage: Even in moments of despair and the unknown, there are opportunities for change and discovering new paths through creative thinking, taking risks, and mobilizing action.